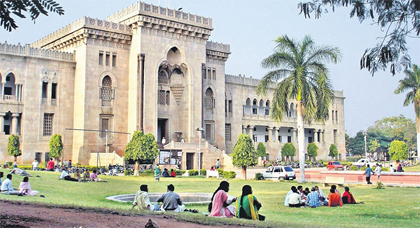 The Osmania University will re-conduct the examination for bachelor of science for certain subjects in the last week of June 2018 following recommendation by a committee constituted by the varsity to probe the fire mishap that occurred on June 5. The committee found that nine percent of the 87,000 scripts were damaged and remaining were partially damaged in the accident. The committee, on closer scrutiny, inferred that the damage was partially due to the fire and more due to the water used to douse the fire. Water soaked more answer scripts making them illegible for valuation. According to a press release issued by the university on Tuesday, the committee made the recommendation in order to maintain continuity in progression of students academics. “All students, except those booked for malpractices, have to reappear for the semester exams as per the revised time table to be circulated shortly to the colleges and to be displayed on the University website. Students need not pay any exam fee and can take the exams in the same centers with the same hall tickets issued earlier,” read the press release. The committee suggested an overhaul of the infrastructure, security and safety measures at the spot valuation centre to pre-empt any such accidents in future. “A series of measures have also been suggested to prevent recurrence of such mishaps and these include: augmenting the safety and security measures at the spot valuation centres,. periodic checkup of the electrical safety devices, construction of a new building for counting and coding work, replacing the conventional coding system with a bar coding system and posting qualified technical personnel to man the centre,” states the release. The coding room housed the BSc scripts of the affiliated and constituent colleges belonging to the second (regular and backlog), fourth semester (regular), first and third semesters only backlogs. Specifically, the room had zoology and mathematics papers of first and third semester (backlog), zoology, botany, physics and mathematics of second and fourth semester (backlog and regular), and zoology, botany, physics and mathematics (regular) exams of the fourth semester. The university is also planning to switch over to online evaluation in a phased manner.